Looking for more in-depth information about the American River canyons and whitewater rafting? The American River: A Recreational Guidebook features information about the natural history and geology of the area. This book also provides a mile by mile description of the canyons, river access, and more. 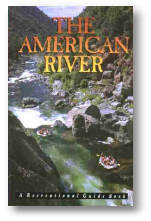 Segments of the www.American-Rivers.com website have been excerpted directly from this book, with permission from "Protect American River Canyons (PARC)". PARC is a community based watershed education, river service and research group dedicated to the conservation of the wilderness, recreational, cultural and historical values of the American River and its canyons for all to enjoy. This 350 page resource guide to the canyons is one way they have concentrated their efforts toward this cause. This website provides a mile by mile overview of the rivers. In the book, you will find additional information about specific hazards, scouting and safety locations along the river. Popular trails contained inside Auburn State Recreation Area are also noted.